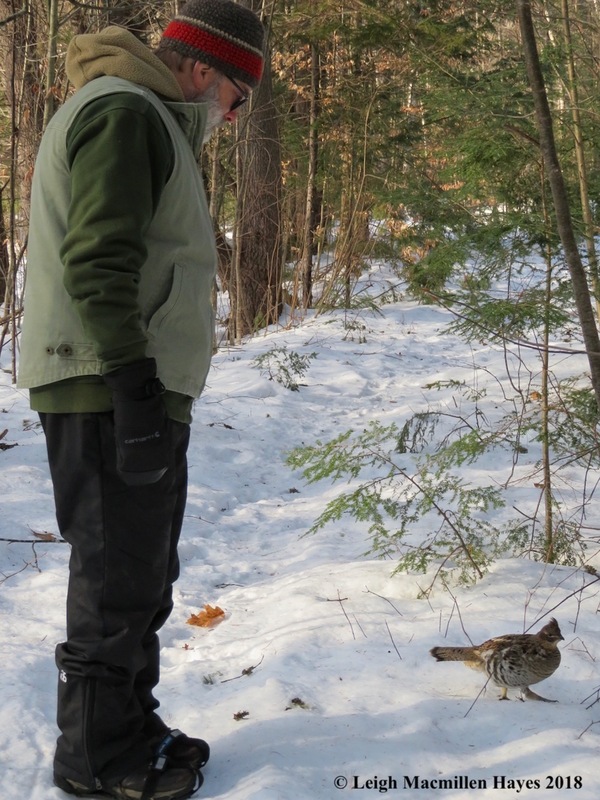 And so it was that I tramped with a couple of friends today who had the delightful pleasure of meeting ArGee (R. G. for Ruffed Grouse). We’d been chatting and searching for a few red blooms on a tall staghorn sumac when suddenly we spied him crossing over a stone wall and approaching us. He circled and circled for a while as we stood still yet continued to talk–sharing admiration and awe at the opportunity to be in his presence. We watched him forage for seeds and wondered about his behavior. 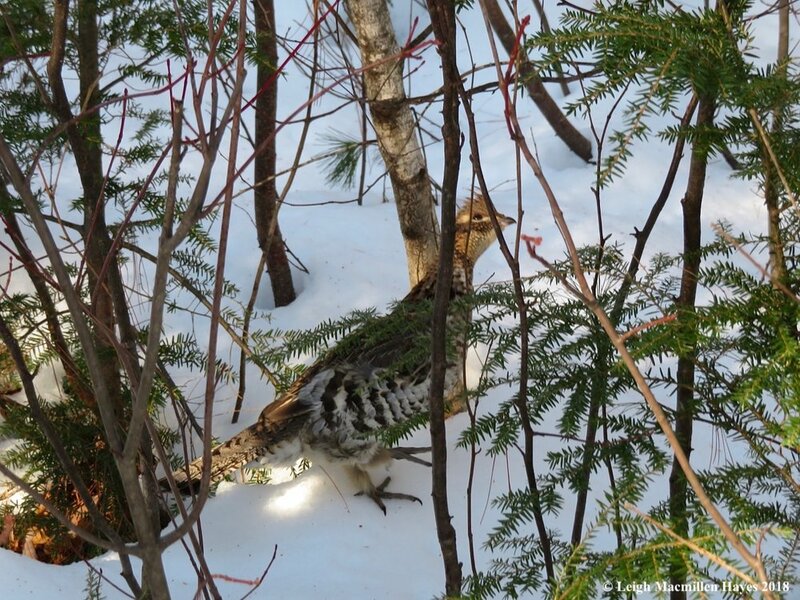 Typically, Ruffed Grouse are loners, except for mating season. But this one seems to greet visitors to its territory with somewhat regular frequency. When we moved, he did likewise–usually a few feet to either side of us. And when we stopped, he did the same, seeming as curious as us. 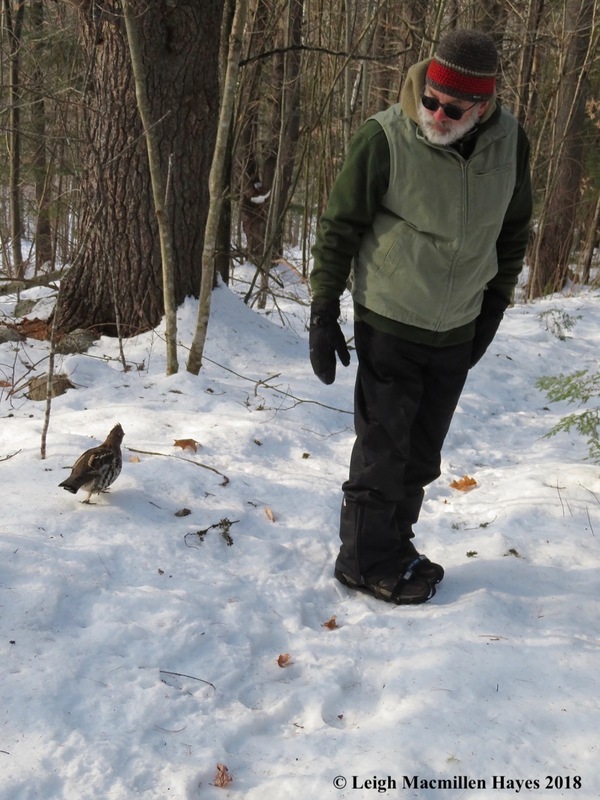 It was a brisk morning, so periodically he did what birds do to warm up–turned into a football of sorts as he fluffed up his feathers to trap warmer air. 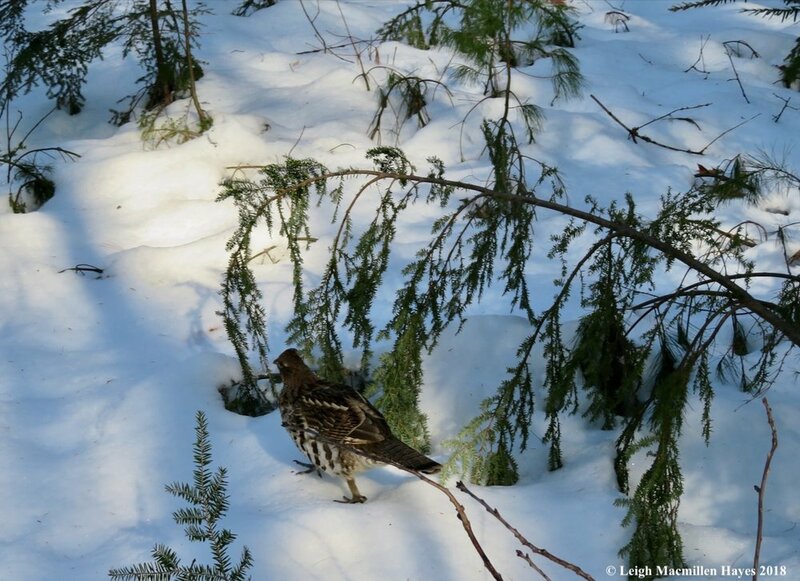 A bird’s body heat warms the air between its feathers and the more trapped air, the warmer the bird. After all, he didn’t have the luxury of hand warmers. But then again, we didn’t have the luxury of trapping air within our feathers. While we watched, I couldn’t help but notice the auricular feathers–those stiff feathers that cover the bird’s ear and form a triangular patch that extends back from the bill and the middle of the eye. Do you see what I mean as they fan out below ArGee’s eye? Here’s another look. And notice that beak–sturdy and down-curved for eating buds and twigs, the bird’s staple in winter. 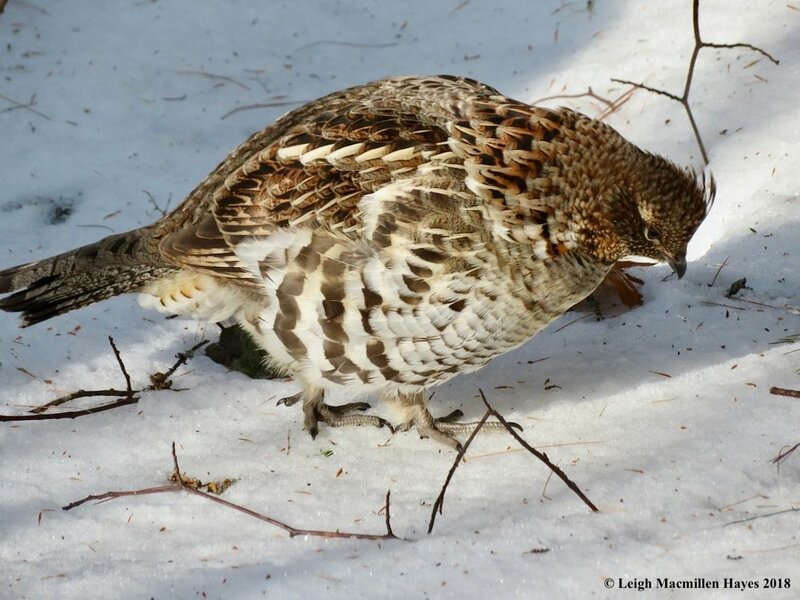 Survival isn’t easy for a Ruffed Grouse, but despite his affinity for people, ArGee knew to take cover occasionally and perhaps that is why he is still among us. That and maybe the fact that we’re honored to be in his presence and learn more about his species as we have the ability to study him. 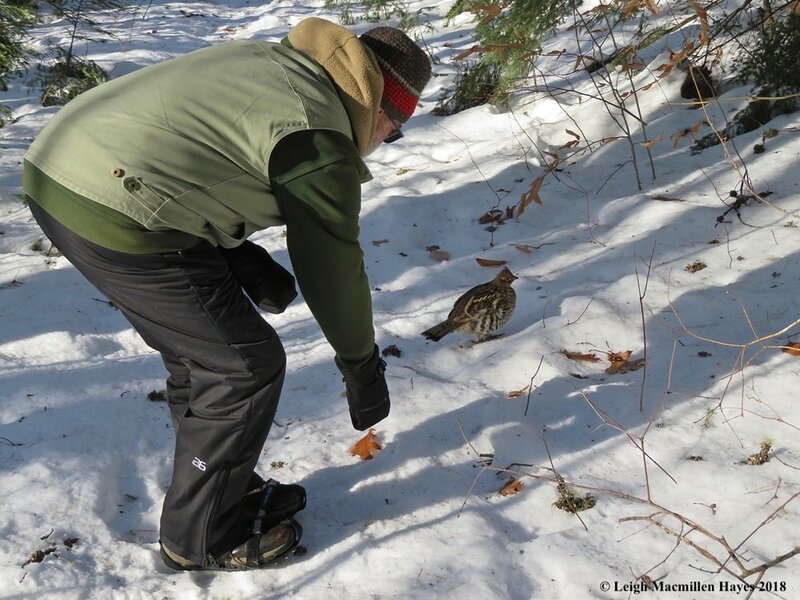 While I’d previously noted the comb-like scales on his feet that act as snowshoes and perhaps add stability somewhat like a porcupine as he’ll search for buds in trees once winter advances, today’s understanding included noting how ArGee moved–with one foot placed in front of the other. I’ve seen it displayed in the tracks left behind including this old set we found further along, but watching the proximity of one foot to another as ArGee moved added a vision and understanding to the signs left behind. Sometimes it seemed the feet were practically touching and other times there was a bit of space between them. Then again, at times ArGee paused and that seemed to be when his feet where closer together and other times he marched or ran beside us and there was a bit of distance between the two feet. Our time with ArGee lasted maybe a half hour or less. And he wasn’t always puffed up to stay warm. When he returned to his original size, his chicken-like form seemed more apparent. Always, he searched for buds to consume. 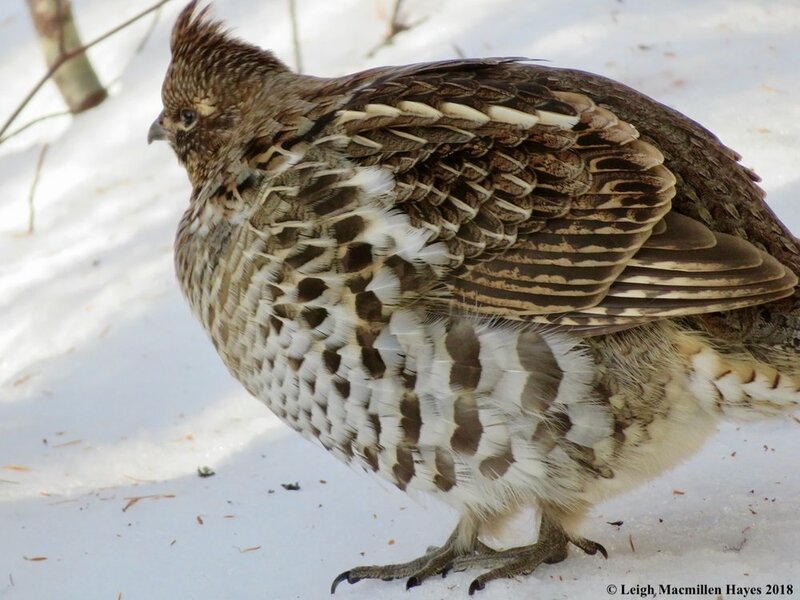 Ruffed Grouse have a special internal adaptation, most helpful for their winter diet–similar to that of deer and moose, which is rather funny when you think about the fact that most Ruffed Grouse burst out of the snowpack and scare the daylights out of us as we approach and make our hearts beat rapidly as we’re certain we’ve encountered a moose. Maybe they should be named Ruffed Moose instead. So back to that internal winter adaptation: they store food in their crops (esophagus) until later and then within their bodies are two offshoots of their intestines, called caeca, which grow enormous each autumn and allow them to break down cellulose so they can get nourishment from the woody aspen and birch buds that they prefer. Come spring, the caeca atrophy for the warmer months. Our lesson from ArGee ended in much the same time frame as it usually does, but he left us wondering all the same. After we’d spent time moving and stopping together, suddenly he started to gently attack the backs of our legs. It was at a spot that seemed to delineate his territory given past experiences, but why the attacks? Did he want us to leave? Not leave? Were we suddenly seen as the aggressor? All along he’d seemed as curious about us as we him and so we were left to ask questions which we did for the rest of our journey. But wow. We were given the opportunity to wonder. And wonder we did. What did ArGee see in us? And what was he thinking? Bird brain? What passes through it? We may never know, but we do know that our lives were enriched and the landscape is alive. P.S. Pam and Bob–this one is for you! Wow!